I was privileged this afternoon [written October 26] to spend time with Sister Margherita Marchione, the so-called “fighting nun,” who has spent 50 years battling to defend the truth about the life and activity of Pope Pius XII, who reigned from 1939 to 1958, during the time of the Second World War. Sister Margherita, who hails from Morristown, New Jersey, where she lives in Villa Walsh convent, in the motherhouse of her order, the Religious Teachers Filippini, is now 89, and will soon turn 90. She told me she is feeling a bit tired, and she has a slight cold. Today may actually mark a shift in the historical fortunes of Pope Pius. 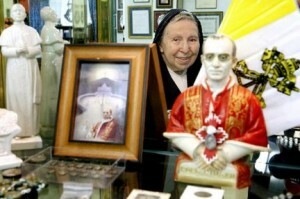 Today, for the first time in recent years, the City of Rome, in the person of its mayor, took a public position in favor of the war-time pontiff, expressing support for a project of Sister Marchione to open in Rome a museum dedicated solely to Pope Pius XII. “It is not my personal decision to make,” said the mayor of Rome, the Honorable Giovanni Alemanno, who was present for the presentation of the museum project. The presentation occurred in the Pinacoteca of the Capitoline Museum, which sits atop the Capitoline Hill in the very center of Rome. Why would the city council of Rome — which is, after all, a secular, not a religious, body — desire to honor Pope Pius XII, who is generally regarded in America and elsewhere as the controversial “silent Pope” who allegedly did not “speak out” against the Nazi persecution of the Jews? Because the Romans are increasingly persuaded that the accusation against Pius is a calumny. Because they are persuaded that Pope Pius not only saved the city of Rome from Allied and German bombardment, but also saved between 5,000 and 13,000 Jews in Rome from deportation by the Nazis in October 1943, by ordering Catholic monasteries, seminaries and convents to open their doors to Jewish refugees. De Lillo went on to say that Pius also made the key decisions which helped save the lives of many thousands of Roman Jews whom the Nazis decided to gather up and ship to concentration camps on October 16, 1943. Thousands fled to convents and monasteries, and found refuge for many months, until the end of the war, he said. I myself have done research in this area — research I have regrettably been unable to complete due to lack of time and resources. But over the years I have managed to videotape conversations with Italian Jews who were living in Rome in 1943, and are still alive today, in their 80s or even their 90s. Each of the people I spoke with expressed gratitude to Pope Pius XII, on film, saying they owed their lives to the actions of Catholics who took them in that fateful day, after the Gestapo knocked on their door, and they fled, usually out the back, to places like the Lateran, for safe refuge. Two years ago I traveled to Israel to meet with the Jewish scholar, Michele Tagliacozzo, who lives on a kibbutz near Haifa, and has one of the most dramatic testimonies. He confirmed his appreciation of Pope Pius XII’s activity, to which he said he owed his own life, in more than four hours of video-taped conversation. I turned my videotapes over to another facinating figure in this long battle over what is the truth about Pius XII, an American Jew from Queens, New York, named Gary Krupp. Along with his wife, Meredith, Krupp some years ago founded the “Pave the Way” Foundation to seek better understanding between Christians and Jews. Only when Krupp began to study the evidence — a good deal of it collected by Sister Marchione — did he change his view. He became convinced that an historical injustice of the highest order had been perpetrated against Pius. “I changed my mind,” Gary repeated to me at dinner last night here in Rome. Krupp handed me a volume of documents. I asked Krupp what one, single document seemed to him most persuasive. And he showed me this document, written by A. W. Klieforth, the American Consul General in Cologne, Germany, on March 3, 1939, just a few months before the outbreak of World War II on September 1 of that year. The document, on American Foreign Service Stationary, was marked: “Confidential.” It was addressed to Jay Pierrepont Moffat, Esquire, Chief of the Division of European Affairs, Department of State, Washington, DC.” Klieforth describes a personal meeting of several hours in the Vatican with Eugenio Pacelli, then Vatican Secretary of State, two years before he became Pope Pius XII. “Even at the risk of duplication from other sources, may I transmit to you the following information concerning the new Pope. “I knew Pacelli in Berlin when he was there as Papal Nuncio. Two years ago when I was in Rome on a holiday, I found the Sistine Chapel closed on the only day I was free to see it. I appealed to Pacelli, then Cardinal Secretary of State for special permission to see the Chapel. I got the permission but I did not see the Chapel after all as the Cardinal detained me for three solid hours and we discussed the situation in Germany. “His views, while they are well-known, surprised me by their extremeness. He said that he opposed unalterably every compromise with National Socialism. He regarded Hitler not only as an untrustworthy scoundrel but as a fundamentally wicked person. He did not believe that Hitler was capable of moderation and in spite of appearances would end up in the camp of the left-wing Nazi extremists when he began his career. He told me that he supported the German Catholic bishops in their anti-Nazi stand. The risk of losing a large part of the Catholic youth in Germany, he said, was not as great as the consequences to the Catholic Church in general throughout the world in surrendering to the Nazis. At that time — it was two years ago — he did not want the German Catholics to do more in their opposition than to practice their religion openly and devoutly but, he added, ‘if the time comes, and there is no way out of the dilemma, they (the German Catholics) will know how to grasp stronger measures.’ Pacelli never gave me the impression of being a ‘peace at any price’ advocate! “He was formerly in favor of the Bavarian monarchist movement which plans to unite Bavaria with Austria under the aegis of a monarch. He always believed that a strong federal Germany was a real dagger to the peace of Europe, and hence to the Church. He liked the German people and appreciated their good qualities but feared them as a strong united nation regardless of the circumstances. “Pacelli, too, was prominent in the Vatican’s Russian policy. It was in this connection that I first learned to know him. At that time, I was working on Russian affairs. He ordained priests and even a bishop in his private chapel in Berlin, whereupon they left incognito for Soviet Russia. Their mission was to train and ordain priests in Soviet Russia. He was responsible, too, for a private college in Berlin fro the preparation for the Catholic priesthood of Russians, formerly members of the Russian orthodox church. The Church plans to use them in Russia when “Der Tag” comes along. A good many starved Russian ex-officers and noblemen were enlisted, not only in Germany, but in other European countries. Among them is a Prince Obelensky, a distant connection of Mrs. Kliefort. Pacelli’s early anti-Communist slant seemingly trained him for his later anti-Nazi one. So the debate over the wartime role of Pope Pius XII continues, and the battle even intensifies, as the labors of people like Sister Margherita and Gary Krupp continue in a way all of us should appreciate and applaud.